PHILLIP ISLAND - In contrast to the first day of pre-season tests at Phillip Island, on the second day Valentino Rossi was satisfied completely. From the beginning until the end of the test, Rossi felt everything it went okay. 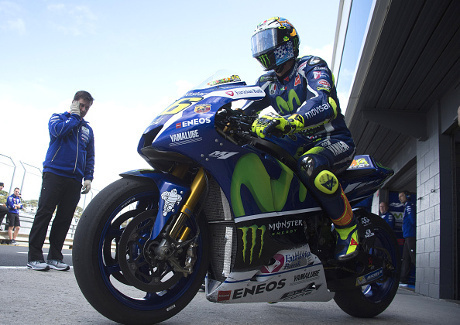 Valentino Rossi became the sixth fastest rider in the test on Wednesday (02/17/2016) yesterday, that run in bad weather. On thursday (02/18/2016) the second day of the test, Rossi have finished in fourth position and only 0.273 seconds difference from Maverick Vinales (Suzuki) who surprisingly appeared almost as a fastest rider. Racing with Michelin tire feels different, but at the same time I enjoy it. Feels very cute. That's important. It's a good day from the beginning to the end. I was able to survive at the top. In the end I was in fourth position but the distance to the first position is very close and I also don't need to use the new tires at the end. Rossi said, Yesterday I only take 7-8 rounds, but the first impression when it was bad and I was a little worried. But today in good condition, since morning I have been able to go faster and get a good taste. We'll see tomorrow and we also can continue to make step by step of improvement. We made a lot of improvement, he said. Image property of Getty Images.